I love helping others and one of the common threads I see is how everyone has what they need already in them. We search high and low for things to improve us, and yet that which we need to improve us already lies dormant within us. Most of us would swear that that quality is not inside us, when indeed it is! The challenges finding what we need within us, getting it to the surface so we can use it, and then tapping into that resource when we need it. The difficulty is not finding it. The difficulty is admitting that it is within us. For example, if someone says that you can do a certain thing… say take on a huge project… you will probably deny that you have the qualities necessary to complete that task, when indeed, the person requesting it from you knows very well that you. Today I heard some commotion out in front of my house, in the street. I went to check on what was making the noise and found people from the water department searching in my yard. They had some basic tools, long rods to punch into the ground to find a manhole cover. When I when outside, they saw me and asked me if I knew where a manhole cover might be in my yard. I told them that I had lived in this home since 1999, and that I’d never seen a manhole or a manhole cover in my yard in all those years. Just about that time another truck pulled up. This truck had some more sophisticated equipment on it. I had a few things to do and I had to go back inside. But as I walked in my door I heard one of the guys say to bring the metal detector. If there was a manhole cover in my yard these guys were going to find it today. But I walked in my house knowing that they would never find a manhole cover because in all the years I’ve lived there, there have been no manhole covers, or people looking for manhole covers. Today is trash day on my block and I found a few more things to stick in the garbage can after I’d already gotten it out to the curb. I’m sure you do that, too. So I’m my way out to the curb and take a look over to the side of the yard, and lo and behold there is an manhole cover unearthed! It was sitting so close to the tree that it was the last place I would’ve looked! 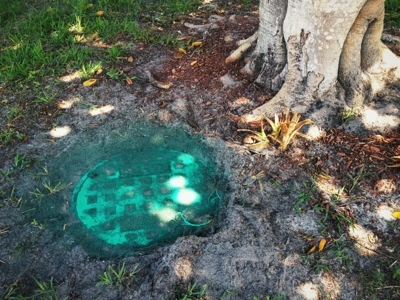 Nonetheless, even being here for over 10 years, I must admit now, there is a manhole cover in my yard! And this just goes to show you that there’re unexpected things lying just below the surface. We have to look for them; most are there just waiting for us to use them. Have you looked? Have you checked? You emotion you need, the tool you need, the strength you need, may be lying just beneath the surface of your life. Just as the manhole cover, since it hasn’t been used in many, many years, it probably needs some cleaning up and working out – a little exercise. But just because it’s not in shape doesn’t mean it doesn’t exist. Look within for what you need. Ask God to help you find that what you need for today. He’s already placed it within you. All you have to do is dig down a little bit. It’s there!